The Saginaw Gears were in their second season of existence in the International Hockey League by 1973-74. The Gears were a secondary affiliate of the Minnesota North Stars and were still owned by former North Stars executive Wren Blair. Former EHL tough-guy Don Perry returned behind the bench, and would remain their through 1981. 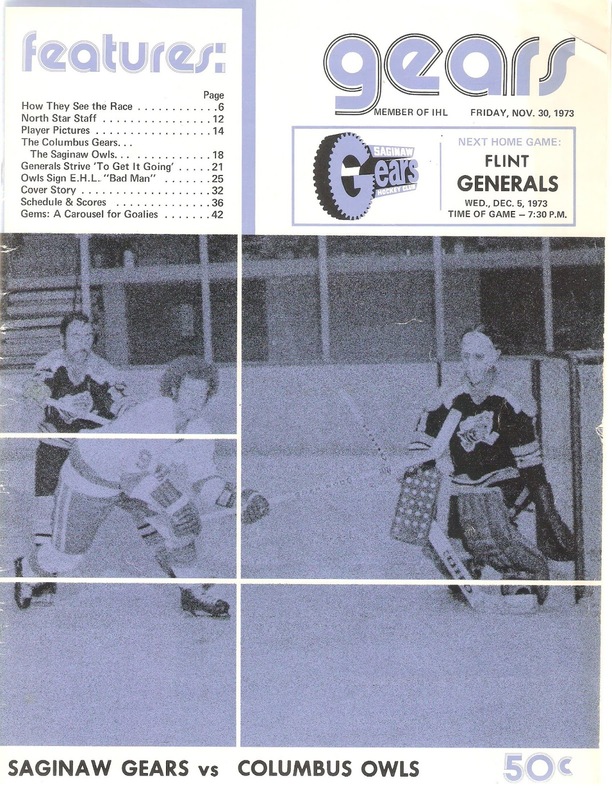 The Gears played their home games at Wendler Arena (now the Dow Event Center). After a dismal inaugural season, the Gears roster got a bit of a makeover. The core of last year's team, including Dennis Desrosiers, Marcel Comeau, Stu Irving, Mike Hornby and Russ Friesen, returned for Year Two. An offseason trade with the Dayton Gems brought in defenseman Gordie Malinoski, who supplied both experience and brawn (333 PIM). The Gears were a much-improved squad in their sophomore season, finishing with a 38-34-4 record. Their 80 point finish was a 17-point improvement over 1972-73 and placed Saginaw comfortably in second place, 14 points behind first-place Muskegon, but 13 ahead of third-place Toledo. Don Perry's team scored the second-most goals in the IHL that year, pumping in 310. Leading the way was right winger Marcel Comeau. Comeau, a North Stars prospect in his second year, scored 31 goals and 82 points on the season. Rookie Jim Johnston, fresh from Wisconsin, led the team in goals with 34, while Dave Cressman added 32. Five other Gears scored at least 20. Desrosiers, rejoined the team partway through the season and added 18. Team defense was improved in Year Two, as Saginaw allowed 282 goals, down from 304 in Year One. Veteran Jim Armstrong and youngster Sam Clegg shared the netminding chores that year. Clegg started the majority of playoff games that year. 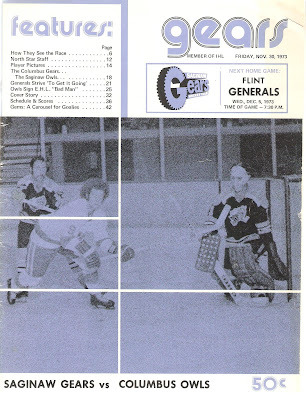 The Gears qualified for the Turner Cup Playoffs in 1973-74, and made their first trip a memorable one. They opened the playoffs with the Dayton Gems, who sported a nearly identical record (38-35-3). The Gears dropped Game One in Saginaw, then rolled off three straight wins to advance to the semifinals. The Gears then swept aside the Columbus Owls in three straight, allowing only five goals, to advance to the Turner Cup Finals. Unfortunately, Saginaw ran into the Des Moines Capitols, who held the IHL's top record at 45-25-6 as well as it's top offense (316 goals). The Gears were outscored 23-10 and were shutout twice, but stretched the series to six games before falling to the powerful Capitols. This is the only program (so far) I have seen from the 1973-74 season. It's in decent shape for it's age, with a little wear around the crease. One page was creased when it was printed. The program is 54 pages long, mostly in black-and-white, but there are quite a few color ads as well. The usual stats and recaps of last season are included. Stories from around "The I" are found throughout, along with pictures of every Gears player. A scorecard is found on page 24, but considering this is from 1973-74, I imagine the penalty section was too small. Local ads include Saginaw Steering Gear (where the team got it's name), Downtown Saginaw Mall (which is a parking lot now), WNEM TV 5 and the Colonial Inn. The opponent for that night's game was the Columbus Owls. The Owls were another team having a turnaround season in 1974. The previous year, the franchise was known as the Columbus Golden Seals and were owned by the notorious Charles O. Finley, who also owned the NHL's California Golden Seals and MLB's Oakland A's. California was a bottom-feeder and almost barren of talent, and it showed in Columbus, as the IHL Seals went a miserable 10-62-2, a league record for losses. In 1974, the team was bought by Al Savill, rechristened the Owls, became a farm club of the St. Louis Blues, and went 40-34-2, one of the greatest single-season turnarounds in IHL history. Aftermath: The Gears would switch affiliates after the 1973-74 season, joining up with the Toronto Maple Leafs and Los Angeles Kings. The Gears would remain with these two teams for most of their existence. "I.H.L. 1973-74 Regular Season Statistics", Photo Album: 1978-79. Saginaw Gears Hockey Club.